Hey guys! Today I’m going to talk about a product that I’ve wanted to post about for a while. It’s for those who are looking for that flawless finish to our makeup that not only reduces pore size and helps our makeup to last longer, but that also looks like real life photoshop or an in person filter. Yep, that’s right. We’re looking at HD Powder again today! 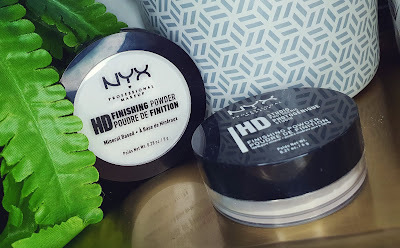 I’m going to be discussing the NYX HD Finishing Powder in both pressed and loose form. They’re the exact same powder, but just packaged in different ways. As you’d expect, the loose and pressed versions do apply differently, so I’m going to go into the differences as well as pros and cons of each throughout this post. The NYX HD Finishing Powder is a lightweight powder that is designed to finish your look by minimising the appearance of pores and fine lines whilst also providing a matte, filtered looking finish. It is available in three shades; white/transparent, banana and green. I have both the loose and pressed in the shade white/transparent, but I will be talking a bit about the differences between how they apply to the other shades in this post. The loose powder comes packaged in a transparent plastic pot with a black screw cap lid. The inside has a layer of plastic with holes in to help to control the amount of powder that is dispensed at a time. The pressed version comes packaged in a sleek, black, plastic compact with a transparent section on top to see the powder through. The packaging can get pretty scratched up over time with frequent use as can be seen on my loose powder pot. 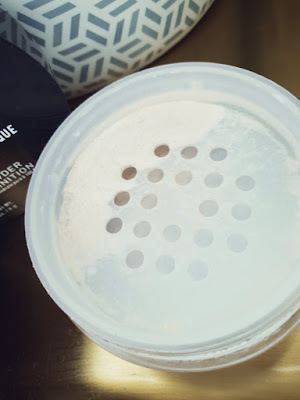 Take a brush and apply a small amount of powder over the top of your makeup (or just onto makeup free skin) wherever you want or need the powder. For example, you may want it all over the face, or you may just want it under the eyes or the T-Zone. Wherever floats your boat. I definitely recommend using a small amount and building up if you need more. This goes for both the loose and pressed variant. Too much will show up instantly and that is not the look that you want. I’ll cut straight to it - I’ve used this shade in both loose and pressed form and I would say that the pressed is the better of the two in this shade. Whilst the loose powder is better for baking, the flashback is also a lot worse than the pressed version. If you don’t know what flashback is, it’s basically where the powder shows up and looks like flour on the skin when somebody takes a photo of you with flash. You’ve probably seen photos of celebrities like this with people talking about "makeup misshaps", but this is what it is: HD Powder. With all that said though, I think that the finish looks better in daylight with the loose powder, so the better of the two depends on who is wearing it, where you’re applying, where you’re wearing it, etc. To make this a bit easier to understand, I’ll write out some simple pros and cons of each, which to be honest are just opposites of one another (as in ones pros are the others cons and vice versa). Pros: better finish in daylight, good for baking. Cons: takes longer to apply, messier to apply, big dust cloud that can choke you, doesn’t last as long (as in you go through the powder faster), more flashback, not ideal for travel, not good for darker skin tones. Pros: easier and faster to apply, less messy, lasts longer in the pan, less flashback, more ideal for travel. Cons: not as smooth a finish, need more for baking, not good for darker skin tones. Putting the differences aside, there are common traits between them. With both I find that whilst they do help to keep the skin looking matte all day, you may experience some caking and settling into fine lines around half way through the day. It pays to be light-handed with this powder and to dab it on with a brush rather than blend and buff it onto the skin. I keep a small makeup sponge with me to blend it back out when needed, but I do recommend using a finishing spray alongside it. I use the Japonesque Makeup Setting Spray over the top of the powder and it really makes the finish look more perfect as well as the longevity better too. You’ll still need to blend it back out during the day, but it’s not as bad as without the spray. So what about the other shades? 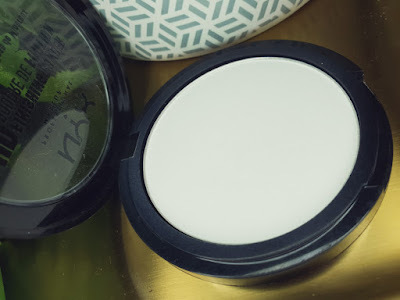 After having a read online and having a chat with one of the NYX staff in one of the Boots stores in Nottingham over the festive period, I think that it is safe to say that the banana shade is the better option with these powders. She was explaining to me about how it’s been almost impossible to keep the banana shade in stock as it’s so popular and I believe that is because it is the better shade. "So why is that? ", you’re probably wondering. Well, the main thing is that it doesn’t have any flashback. It has the same filtered, matte finish as the white but with a yellow-ish tint instead of white which is virtually untraceable on the skin (but I cannot confirm how well it works on darker skin tones) along with the other pros of the white, but no flashback. That doesn’t mean that the white is bad, because it isn’t, but it depends on your scenario. Going somewhere where you’ll be using flash photography? You need the banana shade. Just wearing it casually day to day? White is fine. Your skin tone will also likely play a role. I have very pale skin so white doesn’t tend to show up on my skin easily, but I imagine that the darker your skin tone, the more visible the white may be. If you really want to wear a white HD powder specifically and don’t mind spending more than double the price, you should check out the Make Up For Ever Ultra HD Microfinishing Pressed Powder as it has no flash back (in my experience, but I’m not heavy handed with powder). 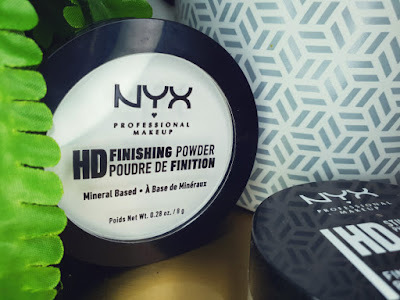 If you want a great HD powder that costs less and has no flashback, check out the banana shade of the NYX HD Finishing Powder. Whilst I was chatting with the lady at the NYX counter she also told me about how the green shade is the least popular to purchase, but is good for wearing underneath powder foundation to balance out redness. Therefore, if redness is an issue for you, don’t buy the green shade as a finishing powder or else you may be sorely disappointed. Buy it as a base shade and add your powder foundation over the top. I haven’t tried the green powder except for on the back of my hand so I cannot say for sure how well it works, so if this is of interest to you then I’d hop into a store to try it out. Overall, this is a very solid product that works just as well as HD powders that are more expensive. This is definitely a trend with NYX products and so far I’ve not been disappointed with any NYX products that I’ve tried. You generally get incredibly high quality products for a drugstore price point. Which shade, or which type (loose or pressed), you prefer will be down to taking your needs into consideration. Please remember that these ratings are for the white shade only and not banana. Whilst I’ve only swatched the banana shade (away from home so no photos sadly), I do believe that I’d be giving it a higher rating than the white shade. If you want to try out the NYX HD Finishing Powder in either pressed or loose, you can find them at Look Fantastic. 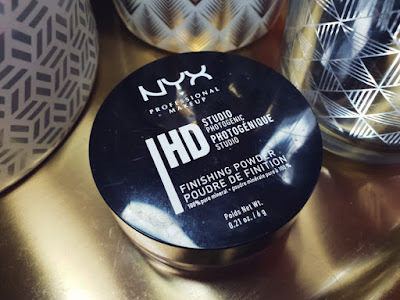 What are your thoughts on the NYX HD Finishing Powder? Which shade is your favourite?